Usually, before heading out of Chicago, the man and I head to Eataly for groceries. Knowing we can find some of our favorite red wines, excellent-quality olive oil, suuuuuper good prosciutto, and freshly made mozzarella, we carry in our huge burlap “Choose your Salumi” bag and fill ‘er up with everything we can find to eat well until the next trip into the city. Almost always, there’s some tasty goodness that catches my eye. A couple weeks ago, it was freshly made, plump butternut squash ravioli that I just couldn’t go home without. Getting home several hours later, I unloaded the ridiculous amount of pasta we bought, and started brainstorming how to make it all and not get sick of the same pasta over and over. Half of the pasta went very traditional- warm and lovely pasta pillows, dumped into a frying pan of browned butter and fried sage, topped with grated parmesan cheese and lots of black pepper. The other half went a little more hefty- I chopped thick pancetta, and let it cook over low heat to get chewy and brown. After removing to a paper towel to drain a bit, I added garlic and thinly sliced shallot to the fat in the pan, cooked both until they were translucent, then stirred in a little cream and some of the pasta water to make a rich sauce. 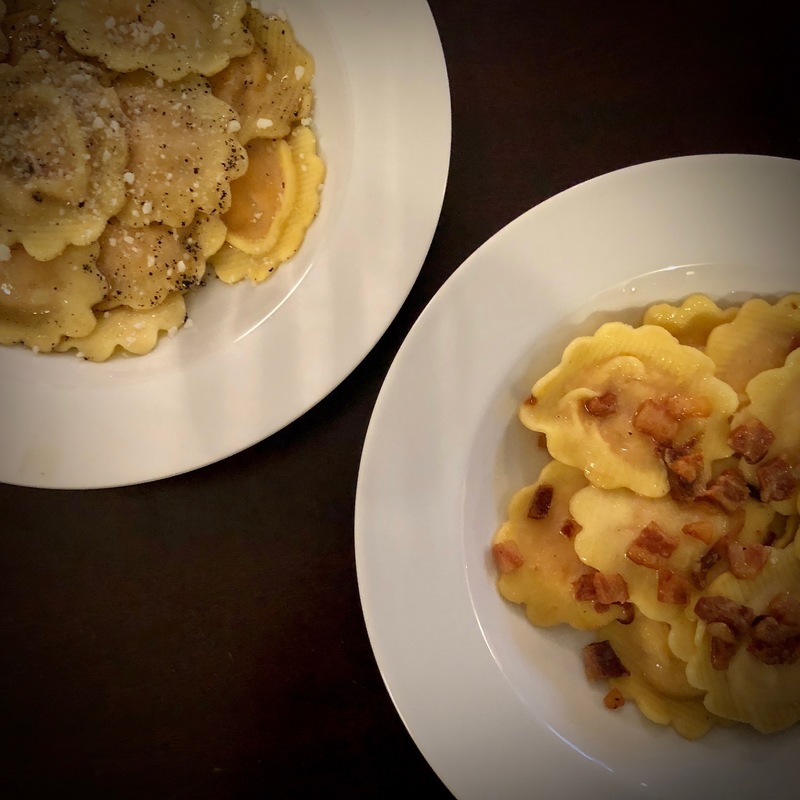 Both dishes were lovely, though I leaned toward the traditional brown butter and sage- I wish I had fried the sage a little crispier, and had gone a little more heavy-handed with the butter. Next time, perhaps, I’m going to try my hand at making a winter squash pasta of my own, perhaps with pumpkin and nutmeg… There’s still some cold weather coming, which means I’ll be munching on gourds for the next few months. In the meantime, there’s still a bit of this butternut ravioli in the freezer, and it’s calling my name.